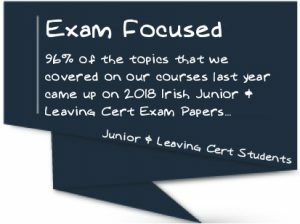 Coláiste Naomh Eoin has successfully established a proven track record of offering Ireland’s highest quality courses and excellent service for over two decades throughout the Leinster region. Our courses are specially designed for both Primary & Secondary School Students. We immerse our students in the full Gaeltacht experience without the cost and stress of leaving home. We aim to inspire a love of the Irish language & culture by make learning Irish fun.